With Fight Night 89: MacDonald v Thompson set to happen at the TD Place Arena in Ottawa, there are plenty of other venues that would make great hosts. Ontario has a surprising amount of 5,000 seat+ indoor venues and that had us thinking…where else would we like to see the UFC host a Fight Night? Surprise, surprise, almost all of them are primarily used for hockey. Nevertheless, we took size, location and population into account so let’s dive into the top five venues for another Fight Night. 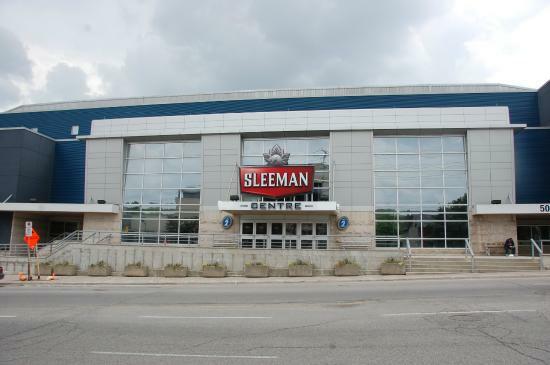 Named after the cool, refreshing and easy-to-drink Sleeman beer (we’re trying to get free beer), the Sleeman Centre holds up to 6,500 people when done up for a concert. Why here? For starters Guelph is a pretty nice area with 120,000+ residents. Add in the fact that the arena is less than a 10-minute drive from the University of Guelph (25-30,000 students), and the event should sell out rather quickly. Hamilton is a somewhat industrial, somewhat university town with a population around half a million. FirstOntario Centre (formerly Copps Coliseum) can hold about 19,000 fans and is only about an hour west of Toronto. For that fact alone, it can be safely assumed that plenty of UFC fans (including us) would be willing to take the trip. About 150,000 people call Oshawa home with another 200,000 folks in the surrounding Region of Durham. The venue, currently used for concerts and minor hockey, offers plenty of room for not just parking but for a UFC Fan Expo if desired. It is very easy to picture a whole weekend event there, with the city currently on a big economic upswing. Windsor often draws American crowds due to it’s close proximity to the U.S. border at Detroit, and vice-versa. Consider the 2014 Winter Classic‘s attendance of over 100,000 for a hockey game between the Detroit Red Wings and Toronto Maple Leafs, even in blistering sub-zero temperatures. The populations of both cities would easily sell out the 6,264 venue two times over. Concerts, hockey and even wrestling often finds its way to the Ricoh. When the WWE comes to town the Coliseum seats 10,279 so it’s a safe bet a Fight Night would a hold similar amount. It’s pretty easy to boast about the location; it’s by the water and fair grounds, close to BMO Field and it being in Toronto means a quick sell out even with high prices. It’s pretty hard to imagine a Fight Night never making it’s way there, considering how easy it would be for fans to show up. Let us know in the comments if the list is missing any venues you’d like to see host an event!